If you’ve spent a good deal of time and effort making your outdoor space enjoyable, it’s a shame to get little use out of it once darkness falls. A quality LED floodlight can illuminate your yard, allowing to enjoy it any time of night or day. This is a particular boon in the fall and winter, when daylight hours get shorter and it’s often still dark when you leave for work and has already gotten dark again when you return. We reviewed dozens of LED flood lights to identify the best of the best. To sort the quality models from the non-so-great options, we considered a range of factors, including power source, wattage, how much light they emit in lumens, ruggedness of build, and what existing users have to say. So, which flood light made it to the top of our must-have list? We chose the LEDMO 240W LED Flood Light due to its incredible power and quality construction. If you have a large area to light, it can’t be beaten. If you’re looking for an exceptionally bright flood light, the LEDMO 240W LED Flood Light is the answer. In fact, it’s so bright that it’s even listed as a stadium light, though you don’t have to be a pro footballer to use it! At $190, it’s certainly not the cheapest flood light, but if you’re looking to illuminate a large yard, this is the perfect option. This impressive 240-watt flood light can put out over 31,000 lumens, which is enough to make it look like daylight when it’s totally dark. The only downfall to its extreme power is that you have to be considerate of your neighbors if your houses are fairly close to one another. It would be overkill if you only have a small yard or you simply want to light up your patio, but it’s ideal for bigger areas. The durable aluminum alloy construction means it will stand the test of time. As it’s designed for outdoor use, it’s completely waterproof, too, with an IP65 rating. The multi-board convection cooling design allows for better heat dispersion and helps prevents overheating. Want a quality flood light but don’t quite need the intense brightness levels of our top pick? The 1000LED 70W LED Flood Light is a very respectable alternative. With an output of 6,800 lumens, it’s still more than enough floodlight for most residential applications and you won’t annoy your neighbors! The $120 price tag is still a lot higher than less powerful options, but is very reasonable when you consider the brightness and quality. 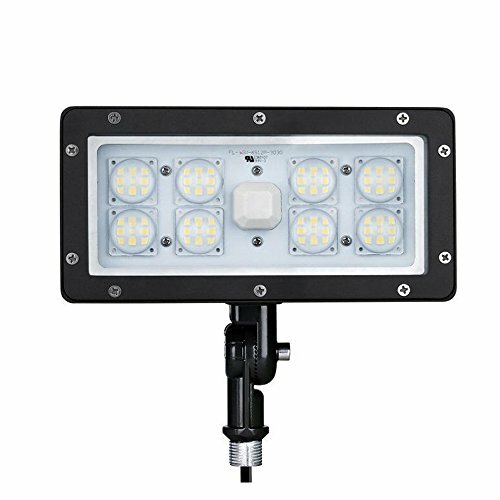 This flood light from 1000LED has an IP65 rating, meaning it’s entirely waterproof and therefore suitable for outdoor use year-round. With a color temperature of 5000 kelvin (K), it falls in the daylight range, so it shouldn’t feel too harsh or too warm. While we’ve focused on the 70-watt model, you can also select from two less powerful 30-watt and 45-watt options. If you’re looking for a simple, yet effective flood light to illuminate your yard and you’re on a tight budget, we couldn’t recommend the Brightech LightPRO LED Yard Light any more highly. This nifty little 5,000-lumen flood light retails at just $50, and produces about the same amount of light as an average street lamp, which is perfect for lighting up a patio or other seating area for after-dark use. Although you can switch it on and off manually, it has “dusk-to-dawn” capabilities. It contains a photo-sensitive cell that knows when night falls, so you can set the light to automatically switch on when it gets dark and switch off when it gets light again in the morning. Where a lot of flood lights have black casings, this one is a much more neutral silver-gray hue, which fits in better with most garden decor. Thanks to the 120-degree wide angle, this little light camp illuminate a much large spot than you might expect. And, with no warm-up time, it’s at full power right off the bat. If you’re concerned about security, a motion activated flood light in an excellent burglar deterrent. Our favorite on the market is the Hyperikon LED Motion Sensor Light. While we’ve featured the 50-watt option, which retails at $40, you can pick from four other wattages, between 30 watts and 200 watts, which will set you back between $25 and $220. 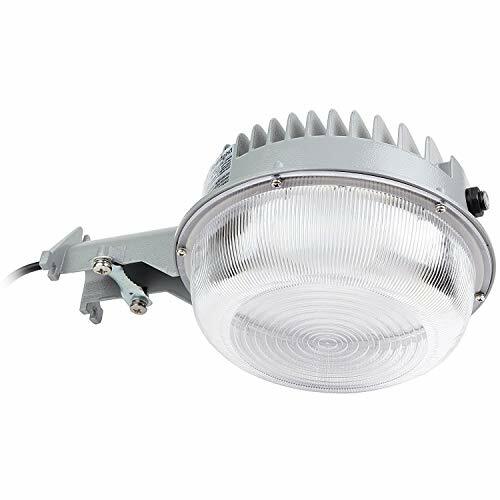 Both fully waterproof and dust-proof, this light is suitable for outdoor use in any weather and can withstand use in sandy desert areas or dusty commercial units. An added bonus to this model is that you can easily adjust the on-time duration of the light (from between 10 seconds and 5 minutes), the sensing distance (from between 6.5- and 33-foot), and the intensity of the light. While motion activated lights aren’t the best for entertaining or spending extended periods of time outside after dark, they’re useful for garages and outbuildings, for security, or for performing quick tasks outdoors, such as taking out the trash. Unless you’re reasonably handy, wiring in a standard mains-powered flood light is a challenge. But, you won’t have that problem with the RuggedGrade Carina Series Solar LED Flood Light. All you need to do is mount it where you want it, wait for a bit of sunshine, and it’s ready to use. 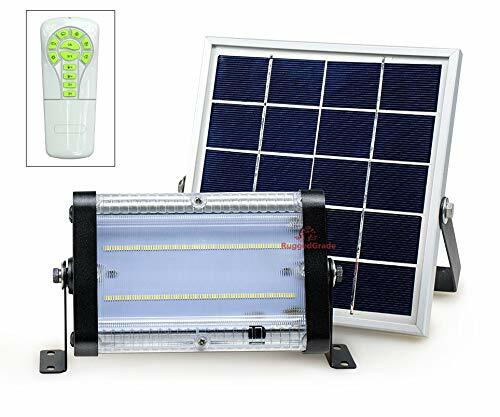 Many solar-powered flood lights on the market are motion-activated, meaning they have limited uses, but this model is remote controlled so you can switch it on and off at will. You might not expect too much from a solar-powered flood light, but this one puts out a very reasonable 2,000 lumens and can run well into the night on a single day’s charge. Of course, it’s not as reliable in the winter, if you live somewhere with a lot of cloud cover, but you mount the solar panel separately from the light, allowing you to angle it however you need to get the most sun, even on an overcast day. With a price tag of $90, it costs more than standard options of a similar wattage, but we think it’s worth paying extra for a solar-powered model, thanks to its ease of installation and eco-friendly credentials. Anyone who has an outdoor space they’d like to use after dark could benefit from an LED flood light. Illuminate your patio or other backyard seating area and it’s perfect for garden parties, post-work drinks, alfresco dining, and late night grilling. However, that’s not the only use for an LED flood light. Some people use them to light garages or parking areas, as security lights at the front of the house to deter intruders, or on construction sites when few other light sources are available. Dimmer flood lights are also sometimes used as “landscape lighting,” to illuminate notable features in your yard. To keep your home and family safe and secure, you should also check out our reviews of the best DIY security systems and the best outdoor security cameras. Wattage. The wattage of an LED flood light expresses the operating power. So, the higher the wattage the more powerful the light. Looking at the wattage can give you an idea of how bright an LED flood light will be, but it’s a measurement of power use rather than a measure of brightness. Lumens. A lumen is a measurement of visible light, so the more lumens a light puts out, the brighter it is. 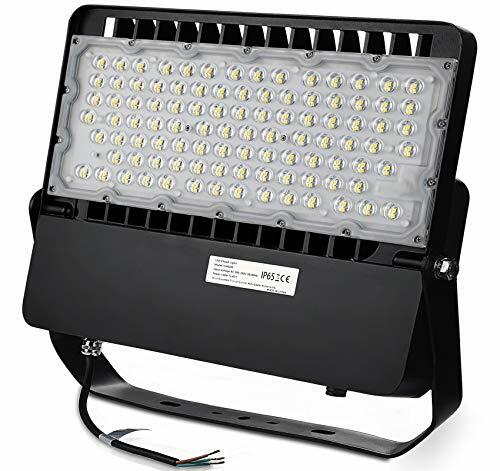 While the number of lumens you need from a flood light is somewhat subjective, something around the 1,000-lumen mark is adequate for illuminating a small patio, whereas you’ll need more like 1,500 to 2,500 lumens to light up a small garden or medium-to-large patio. Power source. Most LED flood lights come with bare wires that can either be attached to a regular plug or hardwired into a line voltage system. If you’re not sure what you’re doing here, it’s wise to hire an electrician to do the technical stuff. An easier option is to go with solar-powered LED flood lights. Weatherproofing. If you’ll be placing your flood light outdoors, it will need to be waterproof. Flood lights are given an ingress protection (IP) rating to show what their level of weatherproofing is. Look for a model with an IP65 rating or higher. Color temperature. The color temperature of light is measured in kelvins (K). The lower the number, the warmer the light. Most LED flood lights emit light of 5,000K or higher, which is pure white or cool white. What are LED flood lights and how do they work? LED flood lights are bright lights designed to illuminate large to extra-large areas. What makes them different to regular flood lights is that they use LED bulbs, which use less power, are cheaper to run, last longer, and are more environmentally friendly than standard incandescent bulbs. Why do they call it a flood light? Flood lights get their name because they emit wide beams, so they “flood” a large area with light. In contrast to spot lights, which illuminate just a small spot. What is the brightest LED flood light bulb? The brightest LED flood light bulb we’ve come across is 600 watts and puts out a whopping 42,000 lumens. That’s far too bright for more residential uses. Are LED bulbs good for outdoor use? Yes, LED bulbs are completely safe for outdoor use, as long as the body of the LED light is sufficiently waterproof. We looked at 20 other LED flood lights. Even though they didn’t make our 5 best LED flood lights list, they’re the best of the rest and each is still a great option for your outdoor space. The information you’ll need to compare each one is included with the listing. With an output of around 8,000 lumens, this 100-watt flood light can light up a big chunk of your yard. With a standard plug already attached, it’s easy to install. This portable flood light is really designed for site use by contractors, but it’s handy for lighting up spots temporarily, for instance, if you want to use a certain part of your yard one night, but usually don’t need it illuminated. Running at 200 watts, with a brightness of 20,000 lumens, this is more than enough flood light for the majority of uses. The impressive 30,000 lumen output and 170-degree wide beam means you can light up a huge area. With an IP66 waterproof rating, it’s suitable for all weathers. With a weaker 40 lumen mode when motion is detected further from your house and a brighter 800 lumen mode when they approach closer, these solar lights are an excellent deterrent. This quality solar floodlight can be wall, post or lawn mounted and runs for up to 10 to 12 hours of a full day’s charge. If you’re looking for a solar-powered security light, this motion activated number fits the bill. With a 950 lumen output, it’s brighter than many similar models. The fairly modest 300 lumen output means this light is only suitable for illuminating small areas, but it’s a good choice for compact yards or if a very bright light would annoy your neighbors. This simple one-piece solar flood light has a solar panel built into the casing. This can make positioning harder, as you might not get a lot of sun in the spot where you want your light, but it looks neater and is simpler to install. With a 3,500 lumen output, this motion activated light is certainly bright enough to deter intruders, and the three lamp heads create an even wider range. A 30-watt security light that emits a respectable 2,400 lumens with an adjustable sensing range of up to 26 feet. 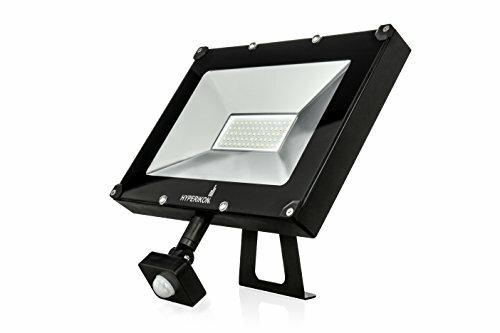 With wide angle beams and a brightness of 1,800 lumens, this flood light can illuminate up to 861 square feet, when mounted approximately 8 feet off the ground. Since you can select from a 15-watt, 30-watt, or 60-watt option, you’ll find a flood light to suit most brightness requirements. With four choices, from a 10-watt, 800 lumen model to a 50-watt, 4,000 lumen model, there are flood lights to illuminate a range of different-sized areas. With a brightness of just under 1,400 lumens, this compact flood light is great for lighting up smaller areas or even for dramatic landscape lighting. Another warm white flood light option, though with an output of just 750 lumens, this doesn’t throw out enough light for all applications. A rechargeable, battery operated flood light that’s perfect for working on construction sites or for emergency use. Lightweight and easy to carry. With an output of 4,800 lumens, this sleek and compact flood light is plenty bright enough for most uses. The 3000K light color is a warm white light, perfect for illuminating relaxed garden gatherings. Although the 2,400 lumen output might not be enough for some buyers, it’s still more than bright enough for lighting up medium-sized areas. This slimline LED light is way brighter than you’d expect for its size and is backed by a 5-year warranty.